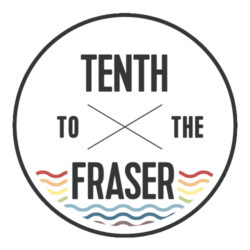 Throughout January, Tenth to the Fraser is spotlighting advice from local experts on how to successfully follow through on New Year’s resolutions. This is a guest post by Svetlana Balysheva from Bamboo Yoga. If you’re interested in trying Yoga as part of your fitness regimen in 2010, enter our Haiku contest for a chance to win a $100 gift certificate for Bamboo Yoga. To be successful on a weight control journey one should be able to answer these questions. Image: Michelle May, M.D. 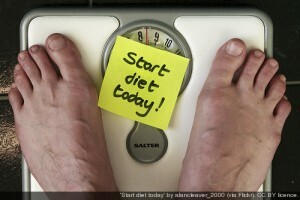 There are hundreds of diets you can try but unfortunately not many of them work. One important link is missing: the link between our state of mind and our bodies. Take a close look at the the “Eating cycle” diagram to the right. Do you ask yourself these questions? Can you answer these questions consciously? Are you able to adjust your eating pattern accordingly? To be successful on a weight control journey one should be able to answer these questions. Practicing yoga increases body awareness and leads to mindful eating which will dramatically increase diet success in people who want to lose weight, and prevent weight gain in individuals of normal weight. The American Dietetic Association has developed a Mindful Eating Questionnaire that addresses the main hindrances to weight loss success: sensual desire, ill will / aversion, inertia, restlessness and doubt. Yoga can be a helpful tool to increase mindful eating as part of a weight control program. More than 300 people participated: 40 percent practiced yoga for over 1 hour per week, 46 percent walked for min 90 minutes per week, and over 50 percent engaged in more than 90 min moderate or strenuous physical exercise per week. Participants’ weight was within normal and the Body Mass Index (BMI) was lower in those who practiced yoga. As you might guess, yoga practitioners with lower BMI achieved higher scores on the Questionnaire . The researchers discovered a strong association between practicing yoga and mindful eating. Interestingly, other types of activities such as running and walking did not raise body awareness to support successful weight control. Learn to love yourself. Learn to love and listen to your body, and it’ll tell you what it needs, when and how much. Regular yoga does build up your body voice so you can hear it and understand. It’s been working on thousands of people over thousands of years and it’ll work on you! Bamboo Yoga, a beginner-friendly yoga studio in New Westminster, invites you to join in the Wellbeing and Weight Loss 12-week challenge from January 13, 2010 – March 31, 2010. For more information, contact Svetlana at 778-385-2064. 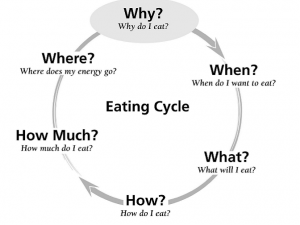 I like your article but please credit the Eating Cycle diagram to me, Michelle May, M.D. It is from my book "Eat What You Love, Love What You Eat" http://www.amihungry.com/eat-what-you-love-book.s…. Hi Michelle, my apologies – I didn't realize the image belonged to you. I've added your name to the credit on the image. Sorry about that! No problem Briana. Thanks for the credit! I am sending to you my appology. Actually, in my original text there is a link to you article where I took this cycle and I gave a credit to you. It is your whole article with your name, etc. 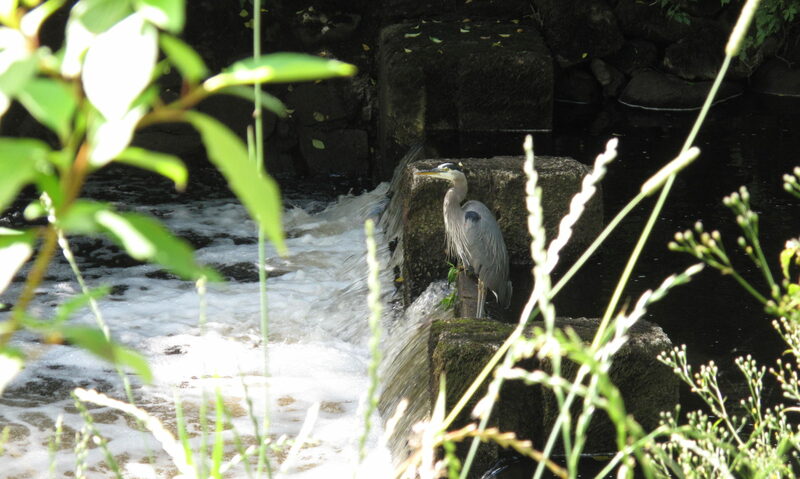 On my web site your article goes with your name and link to your web site as well.